The Grumman F6F Hellcat was constructed in the early 1940's at Grumman Aircraft Engineering Corp. in Bethpage. Unlike its predicessor, the Grumman F4F Wildcat, the Hellcat received a low gear with widely spaced wheels on the main chassis. Significantly, increased both wings and fuselage to accomodate the required fuel and ammunition supply and to provide adequate structural strength. Fixed weapons consisted of six 12.7 mm machine guns. A contract for the construction of two prototypes of the new BuAer fighter was made with Grumman on June 30, 1941. During the entire production period only minor changes were made to the construction of the Hellcat. One of the most important modifications was the used from the aircraft No. 1,900 F6F-3 of the R-2800-10W engine equipped with a water-injection system with methanol. Starting with the No. 3,451, the F6F-3 order was capable of mounting six 127 mm (5 inches) unguided missile launchers. Between the Nos. 1,500 and 2,000, the F6F-5 had the side windows behind the pilot's cockpit were abandoned, and this was the most visible exterior change to distinquish the late F6F-5 from the early production machines. In addition to the standard daytime fighter versions, the F6F-3E, F6F-3N, F6F-5E and the F6F-5N night fighters were also built. Some of the F6F-5N machines were armed with two 20 mm calibre cannons and four 12.7 mm machine guns, instead of the standard six 0.5 in calibre machine guns. A number of aircraft of both versions were adapted to be fitted with a camera in the fuselage. Such modified reconnaissance Hellcats were designated F6F-3P and F6F-5P. Kagero is book publisher based in Lublin, Poland. They produce their books in both Polish and English. This book has both languages in it. 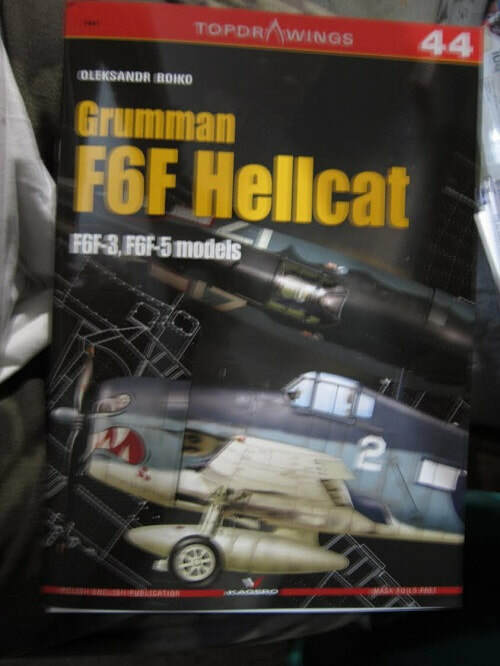 This book is a set of drawings and color profiles of the F6F-3 and the F6F-5 Hellcat versions. It is soft cover of 28 pages in 8 1/4" x 11 3/4" page format. The cover shows a hellcat that has a dark blue spine, over medium grey sides and a white bottom. It has a angy face on the cowl who's mouth is dripping blood. It carry a white 2 fuselage number before the star with bars national insignia. There is illustration of another Hellcat behind it showing an above view. It carries the white fuselage no. 17. Behind both of these is a white line drawing showing the wing of a Hellcat. One corner of the cover art says that there are free mask foils included in the book. This means die cut canopy masks for either a 1/72nd or a 1/48th scale Hellcat model. Neat!! Half of the text in the book is in English and the other half is in Polish. There are 11 line drawings of the F6F-3 to 1/48th scale in the book. Drop tanks are illustrated 4 times to 1/24th scale. There are 17 line drawings of the F6F-5 IN 1/48th scale. Three drawings of rockets in 1/24th scale. Three drawings of bombs in 1/24th scale. Three drawings of wheels in 1/24th scale. Nine drawings of fuselage frames in 1/48th scale. There is a loose sheet in the book that is twice the width of the regular pages and printed on both sides. It has line drawings showing an above and bottom view of the F6F-5 in 1/48th and 1/24th scale. Four illustrations of the interior and canopy windows in 1/24th scale. There are 10 line drawings of the F6F-5 in 1/72nd scale. There are 3 color profiles of the F6F-3, A 4-View of it and a 2-view and a profile of a F6F-5. P-51 Mustang - Me-262 - Fw 190D - Bf-109E - Ki-43 Kayabusa- Junkers Ju 88A - Junkers Ju 87 - Bf-109F - Bf-110G -Supermarine Spitfire - Bf-109A & B - Ilyushin Il-2 AM-38 - Arado 196 - Junkers Ju 88 - Fw-190D - P-51 Mustang - Supermarine Spitfire Mk. IX/XVI & others - Dornier 17/Do-215 - Focke Wulf Ta-152 - Curtiss P-40 -Douglas SBD Dauntless - Henschel Hs-123. Final item in the book is the sheet of die cut, self-adhesing cockpit masking stickers. I wish to thank Casemate Publishers, the North American distributor of Kagero books and the folks at Kagero for this review sample.